Priceless family heirlooms stolen from a house in North Belfast have been reunited with their owner in what has been described as ”an act of humanity” by burglars. 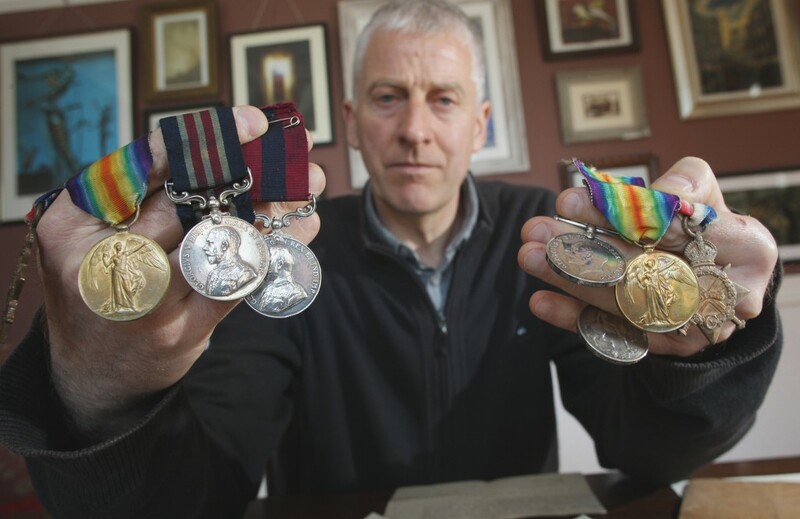 John Pelan said that he was struggling to describe the emotion he felt towards thieves who had raided his home over a fortnight ago, after rare medals won by his grandfather and great uncle over 100 years ago were left outside his Parkmount Road House. Mr Pelan and his wife Gillian where at home on Tuesday night (April 26) when they heard their gate squeak and witnessed a man placing an item on their car before fleeing. Fearful that the parcel may have been dangerous, the pair flagged down a passing police patrol, who uncovered the previously stolen hoard. “I’m delighted and grateful,” said John. “It’s difficult to heap praise on whoever was responsible because they broke into our home but they have shown an act of humanity,” said John. Mr Pelan’s grandfather, Pte McIntyre Shields Pelan, was at the Battle of the Somme while his great-uncle died in France in September 1916. A total of six distinctive medals were taken, including a Military Medal, the equivalent of the Military Cross for the lower ranks, awarded to Mr Pelan’s grandfather and a Distinguished Conduct Medal awarded to his brother William James. “The police wanted to carry out tests on the bag and its contents so we haven’t actually got to go through them yet but from what I have seen they are all there,” he added. Thirty silver dollars stamped with the American Eagle and United States of America that were stolen were also returned. John said that they now hoped to follow through on an idea to loan the priceless items and some old photos to a WW1 museum at Belfast’s Pump-House, where a plaque bears the name of John’s grandfather.